A portable utility designed specifically to remove invasive toolbars and other adware that can slow down your Internet browsing and make your life miserable. This software makes your computer vulnerable by exposing it to other much more malicious software. 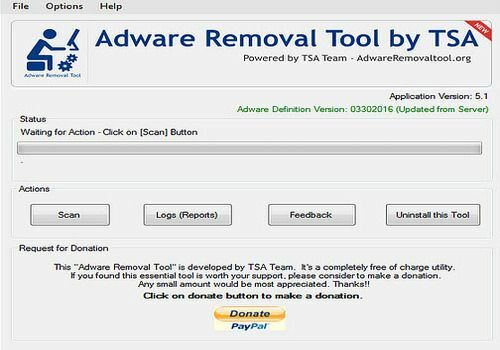 Adware Removal Tool can very easily remove these toolbars that infiltrate your browser interfaces (Internet Explorer, Mozilla Firefox, Google Chrome). The software is free, it will attack the PUPs on your machine without sparing them and will thoroughly clean your registry if unwanted software keys are hidden in it. Be careful, Adware Removal Tool is not a real-time protection solution. However, it will be very useful if you do not have an antivirus or if the one you have installed fails to remove unwanted toolbars. Block access to all the sites of your choice with a single click, protect your computer by blocking access to your USB ports. The tool provided by Lenovo to remove Superfish adware from its laptops.